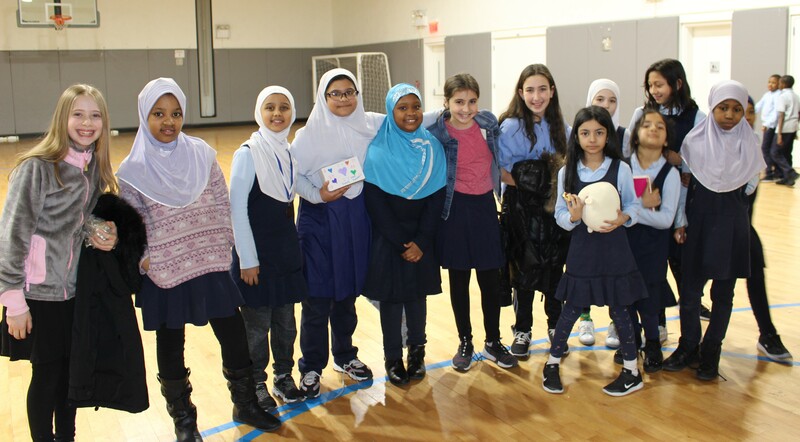 Middle School students led by Rabbi Steinmetz, Rabbi Weinstock, Morah Sandy, and Mrs. Kopel, delivered mishloach manot and offered condolences to students at the Islamic Cultural Center School after the massacre in New Zealand. Rabbi Steinmetz discussed the purpose of the visit and then students had a chance to mingle and chat and eat hamentashen. Eva G. (grade 7) shared her thoughts "I had an incredible time on our trip to the mosque. I had walked past it countless times, but I hadn't ever known what was inside. First, we met the imam. Then, he took us to see his students, who were all around our age. Rabbi Steinmetz gave a quick speech, and then we gave out the hamentaschen. They liked them a lot! Some asked for seconds. When we were mingling around, I was struck by how similar they were to us. I met two eighth grade girls who were wearing medals. When I asked about them, they told me they had just won Science Fair for a solar oven! A fifth grader read us her beautiful poem about the New Zealand shooting, anti-Muslim discrimination, and the importance of standing together no matter what our religious differences are. I wish I could've written like that when I was in fifth grade. Overall, it was an unforgettable experience."